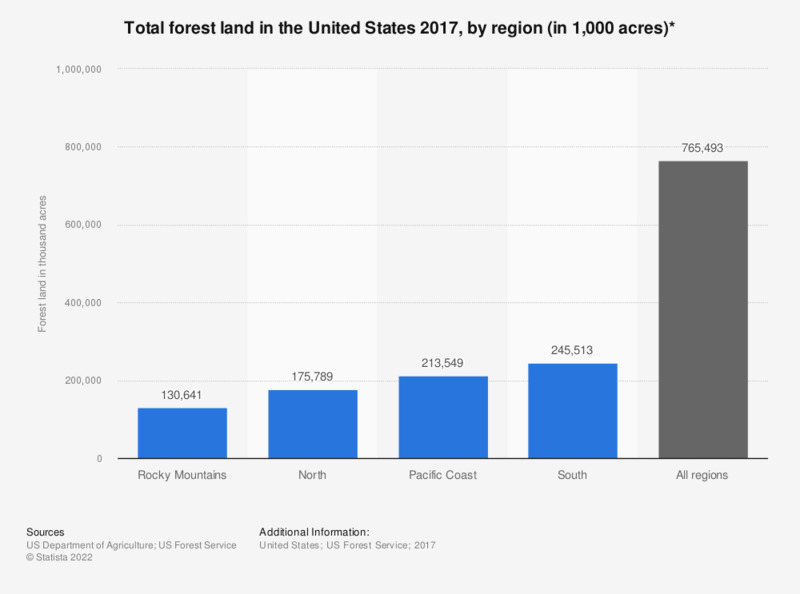 This statistic shows the total forest land in the United States as of January 1, 2017, sorted by region. In 2017, the South had the most of forest land with a total of 245,513 thousand acres, while the North had a total of 175,789 acres of forest land. * Forest land is land at least 10 percent stocked by forest trees of any size, including land that formerly had such tree cover and that will be naturally or artificially regenerated. Forest land includes transition zones, such as areas between heavily forested and nonforested lands that are at least 10 percent stocked with forest trees, and forest areas adjacent to urban and built-up lands. Also included are pinyon-juniper and chaparral areas in the West and afforested areas. The minimum area for classification of forest land is 1 acre. Roadside, streamside, and shelterbelt strips of timber must have a crown width at least 120 feet wide to qualify as forest land. Unimproved roads and trails, streams, and clearings in forest areas are classified as forest if less than 120 feet in width.